I don’t know about you, but every week on a Friday I like to sit down with a cup of tea and look through all the planning applications recently validated by City of York Council, then I read all the agendas for forthcoming meetings, then I note all the other heritage/environmental news. No, not really. But when I notice things of local importance regarding our local environment it seems sensible to pass them on. Just so people know. I’ll try to do this once a week. But if it gets boring, takes up too much of my time and gets no response I’ll not bother, because that would be silly. It’s that time of year when the tree-felling applications flood in. Make your views known on these links if you’re concerned. Usually, no one objects, and often the trees are cut down. City of York Council does have people who look after trees, but in the current climate I imagine they’re overstretched in their workload …? 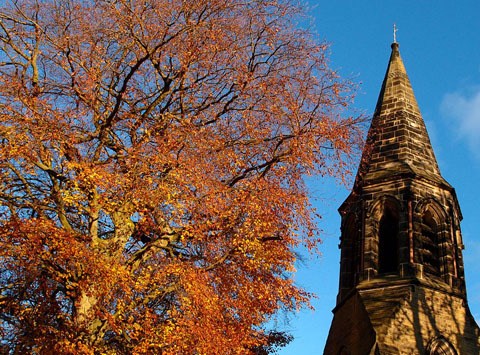 St Cuthberts Church, Peasholme Green want to fell 4 ash trees and 2 lime trees. I’m assuming that these are by the city walls, and that their removal will completely alter the ‘feel’ of the walls walk there. Network Rail want to fell ‘7 leaning trees’ protected by Tree Preservation Orders, alongside the York To Scarborough Railway Line, Bootham Terrace. Not sure which particular trees they mean exactly, haven’t had a look yet and the docs aren’t that clear, but this is an important wildlife corridor, and mature trees should be saved. Please read more on that link. Application to demolish The Junction, Leeman Road, York – might not be needed as a pub, but isn’t reusing a building of this period always preferable to demolishing it? By Lisa @YorkStories • 10 December 2013 Noticeboard, Trees To link to this page's proper location please use the > permalink.